Identification. 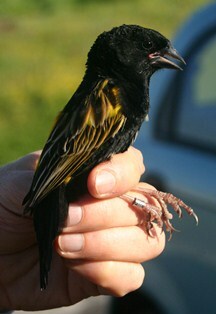 The Yellow Bishop Euplectes capensis breeding male is black and yellow. It differs from the Yellow-crowned Bishop in being larger and having a black head. 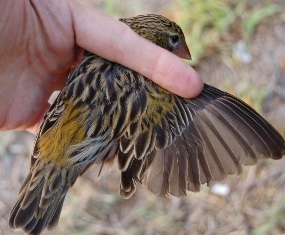 It differs from the Yellow-mantled Weaver in having a shorter tail and yellow rump (not mantle). The non-breeding male is dull with bright yellow rump and shoulders, being the only Euplectes species with a brightly coloured rump in the non-breeding plumage. 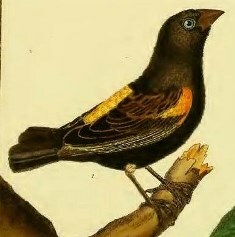 The female Yellow Bishop has an olive rump and is more heavily streaked below then the female Yellow-mantled Widowbird. Distribution. 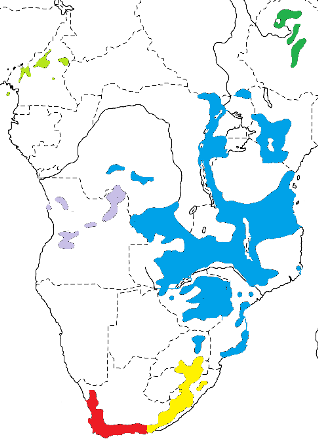 The Yellow Bishop has many described subspecies and here 6 of these are recognised, based on Birds of Africa, see map right). The races differ in the wing and bill colour, and also in the size of the male. E. c. phoenicomerus occurs in the highlands of Nigeria and Cameroon, and on Bioko Island (possibly introduced) (see light green on map). The breeding male has dark brown wings, black thighs, black upper bill often with white flecks, and a white or blue-grey lower bill. E. c. xanthomelas occurs in the highlands of Ethiopia (see dark green on map). 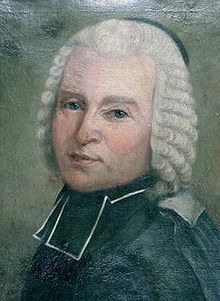 The breeding male resembles crassirostris, but is longer-winged and shorter-tailed. E. c. crassirostris occurs in the Sudan, Uganda, DRCongo, Rwanda, Burundi, Kenya, Tanzania, Zambia, Malawi, Zimbabwe, Mozambique and South Africa (see blue on map). The breeding male has black wings, mainly black thighs, upper bill black, lower bill white or blue-grey. E. c. angolensis occurs in the highlands of Angola (see purple on map). The breeding male has brown wings and thighs, upper bill black and lower bill blue-grey. E. c. capensis occurs in the Western Cape of South Africa (see red on map). 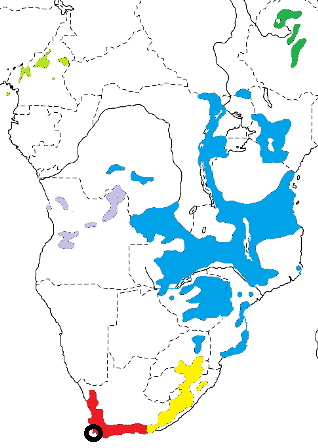 E. c. approximans occurs in South Africa, Swaziland and Lesotho (see yellow on map). 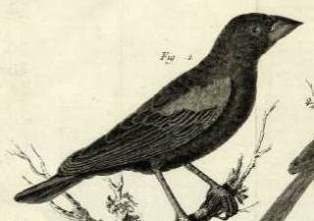 The breeding male has brown wings and thighs, all- black bill, and is smaller than the nominate race. Habitat. The Yellow Bishop inhabits montane grasslands in the north. It occupies some coastal and lowland areas in Tanzania. In South Africa, it ranges from coastal regions in macchia, cultivated lands, rank vegetation along streams and forest fringes up to mountain fynbos and high grasslands. Food. The Yellow Bishop feeds on seeds, mainly grass seeds, and also on cultivated maize, rice and millet. It also feeds on insects like caterpillars, bugs, termites and ants. It forages singly and in pairs, and when not breeding it forms mixed foraging flocks. Breeding. The Yellow Bishop is polygynous, with three or four females per male. It is solitary or found in small breeding groups. The male displays to females entering his territory, with yellow rump feathers puffed up and tail depressed, and flying on a zigzag course. The nest is domed with a side entrance, and placed above the ground in grass or in a small shrub. The nest is woven by the male from grass strips, and living grass may be woven into the structure. It is lined by the female with grass seedheads, which may project from the entrance to form a porch. The male nips off the tops of the herbs around the nest. The clutch is 2-4 eggs, and the eggs are very variable in colour. The female incubates the eggs and feeds the chicks, mainly by regurgitation. Many nests are lost to predation. The maximum recorded longevity is more than 11 years (see here). Old nests of the Yellow Bishop may be used by Karoo Prinias Prinia maculosa or Zebra Waxbills Amandava subflava.